Built in great color combination (Pink, Emerald, Ogrange, and Violet), surely raises your customer interest to buy products from your website. This theme is fully responsive layout that looks great on mobile and all tablet devices. If the product image is large, this layout will automatically adjust thumbnail size to fit all screens. Parna responsive magento theme is extremely attractive, exceptionally easy to customize and extend, has been built with the advanced features of Magento Theme, such as: Mega Menu with multiple columns, attractive slideshow with many smooth effects, ajax cart, ajax layer navigation, search box pro, quick view product, brands slider, product hover effect, and much more to make your online store more productive. Try demo now to experience this awesomeness and to explore more features in this theme. 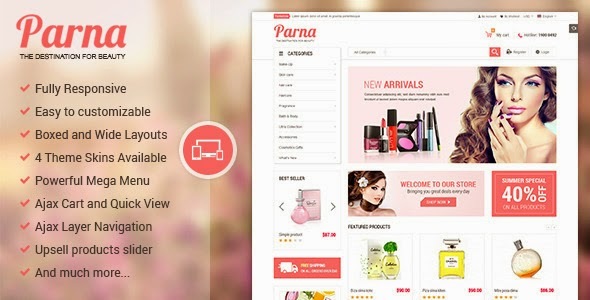 Item Reviewed: Parna - Responsive Multipurpose Magento Theme 9 out of 10 based on 10 ratings. 9 user reviews.